Actor asks his fans for their thoughts and advice about returning to the Riddick universe. Vin Diesel says that filming could start on what he calls a "true R-rated" Riddick movie as early as this summer, provided that he's willing to accept a much smaller salary than he's used to. The first Riddick movie, Pitch Black, came out in 2000, and was followed up by a sequel, Chronicles of Riddick, four years later. Writing on his Facebook page, Diesel said that David Twohy, the writer and director of the first two Riddick movies, delivered the news about the project, saying that the actor would have to work "for scale," which is the acting equivalent of minimum wage, in order to be able to make an R-rated movie. 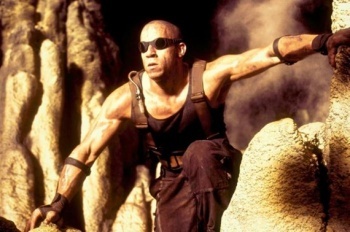 Diesel followed that up by saying that money wasn't the most important thing to him as an actor, but also expressed a certain degree of reluctance to get back into the Riddick character. He asked fans for their thoughts - and having received them in abundance - seemed to decide to at least investigate the project, stating that he was meeting with Twohy to look at concept art and discuss the proposed schedule. The movie supposedly sees Riddick left for dead on a desolate planet, where he must face bounty hunters and alien predators, only to discover that he's a pawn in some grand scheme, and must venture to his home planet to save it from destruction. The synopsis makes it sound a lot more like the Chronicles of Riddick than Pitch Black, although Diesel's comments about an R-rating - Pitch Black was rated R, while Chronicles of Riddick was PG-13 - would seem to suggest that it's actually going to be the other way round. It's also worth mentioning that that synopsis is a year old, and could have changed considerably since then. It's not impossible that we could see another decent Riddick movie - Twohy worked on the good one as well as the bad one - but although it's going to take more than some vague comments about MPAA ratings to generate much optimism. All the same, there's still a chance that we'll be able to forget the second movie ever took place, Highlander 2-style, even if it's only small.